The serotonin transporter (5-HTT) plays a key role in the regulation of serotonin (5-hydroxytryptamine, 5-HT) transmission in the pathophysiology and therapeutics of several psychiatric disorders. The mean spontaneous firing rate of midbrain dorsal raphe 5-HT neurons was recorded in chloral hydrate-anesthetized mice. The serotonin transporter (5-HTT), which plays a key role in the regulation of serotonin was significantly decreased in homozygous mice lacking the 5-HT transporter (5-HTT −/−) by 66% and in heterozygous (5-HTT +/−) mice by 36% compared with their normal littermates (5-HTT +/+). Systemic injection of the selective 5-HT1A receptor antagonist WAY 100635 enhanced 5-HT neuronal firing by 127% in 5-HT −/− mice, thus indicating an enhanced synaptic availability of 5-HT at inhibitory 5-HT1A receptors. Nevertheless, the cell body 5-HT1A autoreceptors were desensitized in both 5-HTT −/− and 5-HTT +/− mice. At the postsynaptic level, the recovery time (RT50) of the firing rate of hippocampus CA3pyramidal neurons following iontophoretic applications of 5-HT was significantly prolonged only in 5-HTT −/− mice. The selective 5-HT reuptake inhibitor paroxetine significantly prolonged the RT50 in 5-HTT +/+ and 5-HTT +/− mice, without altering the maximal inhibitory effect of 5-HT. These neurons in 5-HTT −/− mice showed an attenuated response to the 5-HT1A agonist 8-hydroxy-2-diproplyaminotetralin, but not to 5-HT itself. These results establish that the lack of 5-HTT causes a prolonged recovery of firing activity following 5-HT applications. The genetic deletion of the 5-HTT plays a key role on 5-HT1A receptor adaptation: a desensitization at pre- and postsynaptic levels in 5-HTT −/− mice, but to a different extent, and only at the presynaptic level in the 5-HTT +/− group. The serotonin transporter (5-HTT) is a neuronal element that plays a key role in the regulation of central 5-HT neurotransmission by regulating the duration of 5-HT responses. It has been implicated in the pathophysiology of psychiatric conditions such as affective, anxiety and impulse control disorders, as well as in the regulation of brain development, plasticity, and degeneration (Lesch, 1998). Mutant mice that do not express the 5-HT transporter (5-HT −/−) offer the opportunity to further investigate possible adaptive changes in the 5-HT system in response to increased extracellular 5-HT levels (Fedele and Andrews, 1999). They may also be useful in screening new drugs or developing novel therapeutic concepts (Mössner and Lesch, 1998;Murphy et al., 1999). In the last decade, novel targets to improve antidepressant and antiobsessive-compulsive responses have concentrated on strategies that increase 5-HT neurotransmission by blocking 5-HT reuptake and/or inducing a desensitization of 5-HT1Aautoreceptors (Blier and de Montigny, 1998). Several studies have demonstrated that long-term administration of selective 5-HT reuptake inhibitors (SSRIs) leads to a desensitization of 5-HT1A receptors in hypothalamus and dorsal raphe in rodents (Le Poul et al., 1995; Blier and de Montigny, 1998; Li et al., 1997, 1999, 2000) and humans (Lesch, 1991; Sargent et al., 1997;Berlin et al., 1998). It is now well known that the administration of SSRIs with the 5-HT1A antagonist pindolol have led in most studies to an acceleration of the antidepressant response (Blier and Bergeron, 1997; Zanardi et al., 1998; Maes et al., 1999). Therefore, a better understanding of the role of the 5-HTT in the regulation of 5-HT synaptic levels and its impact on pre- and postsynaptic 5-HT1A receptors may help in the development of better therapeutic approaches for several psychiatric disorders. An important factor involved in the research on mice with reduced (+/−) or absent (−/−) 5-HTT mutant animals is that the heterozygous (5-HTT +/−) mice may offer a good model to mimic the human population. Specifically, human 5-HTT gene transcription is modulated by a common polymorphism in its upstream regulatory region. The short variant produced by this polymorphism reduces the transcriptional efficiency of the 5-HTT gene promoter, resulting in decreased 5-HTT expression or 5-HT uptake in lymphoblasts, cultured cells, platelets, and human brain studied post mortem (Lesch et al., 1996; Greenberg et al., 1999). Anxiety-related personality traits and anxiety-related behavioral consequences have been observed in several other species (Greenberg et al., 2000). Moreover, a reduced central 5-HTT density, measured with the use of [123I]β-CIT (methyl-3β-(4-iodophenyl)tropane-2β-carboxylate) and single photon emission computed tomography, was found in individuals with alcoholism. A significant reduction of about 30% in the availability of brainstem 5-HTT was found in the alcoholics, which was significantly correlated with lifetime alcohol consumption and with ratings of depression as well as anxiety during withdrawal (Heinz et al., 1998). The present study used in vivo electrophysiological techniques to examine the spontaneous firing activity of 5-HT neurons in the dorsal raphe 5-HTT −/− mice and their +/+ and +/− littermates. The responsiveness of 5-HT neurons and of pyramidal neurons in the hippocampus to direct microiontophoretic applications of 5-HT and/or the 5-HT1A agonist 8-hydroxy-2-diproplyaminotetralin (8-OH-DPAT) was also examined. These two neuronal populations expressing 5-HT1Areceptors were chosen because the former but not the latter 5-HT1A receptors have been shown to desensitize following long-term SSRI administration (Blier and de Montigny, 1998). It was thus expected that the genetic deletion of the 5-HTT would at least mimic the adaptations of the 5-HT receptors produced by SSRIs. 5-HTT −/− mice with a CD-1 × 129sv/ev background were generated by homologous recombination, as previously reported (Bengel et al., 1998). All of the 5-HTT −/−, +/−, and +/+ mice used in the studies were from the F5 and F6 generation and were 3 to 7 months of age. Their body weight ranged from 27 to 55 g. After maturation, mice were transported to McGill University facilities and maintained under standard heating and lighting conditions with free access to food and water. Principles established by Canadian Committee on Animal Care were followed at all times. Preparation of the Electrophysiological Experiments. Mice were anesthetized with chloral hydrate (400 mg kg−1 i.p., using a 2% solution) and placed in a stereotaxic frame (using the David Kopf mouse adaptor) with the skull positioned horizontally. To maintain a full anesthetic state in which there was no reaction to a tail or paw pinch, chloral hydrate supplements of 100 mg kg−1 were given as needed. The extracellular recordings were carried out using single-, double-, or five-barreled glass micropipettes (R&D Scientific Glass, Spencerville, MD). Single- and double-barreled glass micropipettes were preloaded with fiberglass strands to promote capillary filling with, respectively, a 1 M and 1.5 M NaCl solution. The single- and two-barreled micropipettes were used for recording dorsal raphe 5-HT neurons and their tips were of 1- to 3-μm diameter. The impedance of the central barrel used for unitary or double-barreled recording typically ranged between 5 and 7 MΩ. The five-barreled micropipettes were used to record CA3 hippocampus pyramidal neurons, with their tips broken back to 8 to 12 μm under microscopic control. Recording of Dorsal Raphe 5-HT Neurons. The single- or double-barreled glass micropipettes were positioned 0.5 to 1 mm posterior to the interaural line on the midline and lowered into the dorsal raphe nucleus (DRN), usually attained at a depth of between 2.5 and 3.5 mm from the brain surface (Franklin and Paxinos, 1997). The dorsal raphe 5-HT neurons were then identified according using the following criteria: a slow (0.5–2.5 Hz) and regular firing rate and a long duration (0.8–1.2 ms), positive action potential. The total number of spontaneously active 5-HT neurons and their firing rates were determined by monitoring their average discharge frequency for a minimal period of 1 min. Recording of CA3 Dorsal Hippocampus Pyramidal Neurons. The micropipettes were lowered at 2 to 3 mm lateral and 2.5 to 2.7 mm posterior to bregma into the CA3region of dorsal hippocampus (Franklin and Paxinos, 1997). The impedance of the central barrel and of the side-barrels typically ranged from 2 to 5 and 30 to 80 MΩ, respectively. Three of the side-barrels contained one of the following solutions: 5-HT (50 mM in NaCl 200 mM, pH 4), 8-OH-DPAT (50 mM in NaCl 200 mM, pH 4), or quisqualate (1.5 mM in 400 mM, pH 8). The fourth barrel used for automatic current balancing was filled with a 2 M NaCl solution. All drugs used were ejected as cations and retained with a current of −10 nA, except for quisqualate, which was ejected as anions and retained with a current of +10 nA. The stereotaxic coordinates for the CA3 pyramidal neuron layer were initially identified using Fast Green deposits and visualized on histological sections. Subsequently, these neurons were identified on-line using these coordinates and by their large amplitude (0.5–1.2 mV), long duration (0.8–1.2 ms), single action potentials alternating with complex spike discharges (Kandel and Spencer, 1961). Since most hippocampus pyramidal neurons are not spontaneously active under chloral hydrate anesthesia, a variable ejection of quisqualate current (from −20 to −2 nA) was used to activate them within their physiological firing rate (8–15 Hz). The responsiveness of neurons to microiontophoretic application of the drugs is expressed as the percentage of inhibition or excitation at the end of the 50-s ejection period. This approach to assess neuronal responsiveness was deemed necessary because 5-HT reuptake inhibition prolongs the suppression of firing of these pyramidal neurons (Piñeyro et al., 1994). Therefore, estimating the entire number of spikes suppressed by an ejection of 5-HT would have represented a composite of the sensitivity of the receptors, occurring during the application, and of the function of the 5-HT reuptake process. This would have precluded the determination of the contribution of postsynaptic receptor responsiveness (i.e., the degree of inhibition of firing during the application of 5-HT) and of the reuptake process to the suppression of firing. Microiontophoretic ejection periods were kept constant at 50 s. Recovery time (RT50) of the firing activity of CA3 hippocampus pyramidal neurons following microiontophoretic application of 5-HT was used as an index of in vivo reuptake activity, which is the main factor responsible for terminating the action of synaptic 5-HT. RT50 is defined as the time in seconds required by the neuron to recover 50% of its initial firing frequency from the termination of microiontophoretic application. The RT50 value has been shown to provide a reliable index of the in vivo activity of norepinephrine reuptake (Gravel and de Montigny, 1987) and of the 5-HT carrier (Piñeyro et al., 1994) in the rat hippocampus. Due to diurnal and seasonal variations of 5-HT receptor responsiveness (Brunel and de Montigny, 1987), experimental series aimed at comparing different groups of mice were carried out within the same time frames. In addition, the order of testing of the various groups of mice was alternated to avoid experimental biases due to such factors. Animals did not receive multiple drug challenges. Chloral hydrate, 5-HT creatinine sulfate, and quisqualate were purchased from Sigma Chemical Co. (St. Louis, MO). Paroxetine was provided by SmithKline Beecham (Harlow, UK) and used as a SSRI to assess the function of the 5-HTT (Piñeyro et al., 1994). 8-OH-DPAT and WAY 100635 were purchased from Research Biochemicals International (Natick, MA), and were used as a selective agonist and antagonist of 5-HT1A receptors, respectively (Haddjeri et al., 1999). All results are expressed as mean ± S.E.M. In all the cases, the n refers to the number of neurons tested. Statistical comparisons among raphe firing rate of 5-HTT +/+, 5-HTT +/−, and 5-HTT −/− mice were carried out by using one-way analysis of variance and multiple comparison procedure (Tukey's test). The currents of quisqualate used to activate the neurons as well as the subsequent firing frequencies in the 5-HTT +/+, 5-HTT +/−, and 5-HTT −/− mice were compared out by using one-way analysis of variance and multiple comparison procedure (Tukey's test). The ability of 5-HT and 8-OH-DPAT to inhibit neuronal firing activity, the RT50 and the effect of paroxetine in 5-HTT +/+ and 5-HTT −/− mice were analyzed using two-way (genotype × drug current) repeated measure ANOVAs followed by a multiple comparison procedure (Tukey's test). The effects of WAY 100635 on blocking the response of 5-HT and 8-OH-DPAT in the hippocampus were compared by one-way analysis of variance for each genotype. The accepted level of significance for all tests was P = 0.05. Spontaneous Firing Activity of Dorsal Raphe Nucleus 5-HT Neurons and Effect of Systemically Administered WAY 100635. The mean spontaneous firing rate of electrophysiologically identified DRN 5-HT neurons in the 5-HTT +/+ group was 1.50 ± 0.07 Hz (n = 51). The mean firing frequency was significantly decreased by 66% in the dorsal raphe of 5-HTT −/− mice and by 36% in the 5-HTT +/− animals, compared with that observed in 5-HTT +/+ mice (Figs. 1 and2). To determine whether the decrease in firing rate of 5-HT neurons in mutant mice was due to an increased activation of 5-HT1A receptors by endogenous 5-HT, 5-HT neurons were recorded in three 5-HTT −/− mice before and following the i.p. injection of 5-HT1A antagonist WAY 100635 (0.3 mg/kg). In these additional experiments carried out about a year later in a different group of three mice, the firing rates of 5-HT neurons were of 1.18 ± 0.19 Hz (n = 20) before the injection of WAY 100635 and of 2.68 ± 0.27 Hz (n = 31) following the administration of the 5-HT1A antagonist. It is noteworthy that in two 5-HTT −/− mice in which the firing rate of the same 5-HT neurons could be monitored before and after the injection of WAY 100635, their firing rates were not significantly altered. This is consistent with the general lack of effect of this drug on the spontaneous firing rate of 5-HT neurons in intact anesthetized animals (Fletcher et al., 1996). No significant difference was observed in the number of cells/track (data not shown), but there was a tendency for a lesser number of spontaneously active neurons in the 5-HTT −/− mice. It is well known that other types of neurons are also encountered during electrode descents through the rat DRN (Hajós and Sharp, 1996). These non-5-HT neurons include both regular fast-firing (10–20 Hz) neurons, and neurons firing irregularly with rates varying from 0.1 to 10 Hz. The number of the presumed non-5-HT neurons was about 30% of the total neurons encountered and this percentage was generally somewhat higher in the 5-HTT −/− mice. Integrated firing rate histograms of 5-HT neurons illustrating the activity of all 5-HT neurons recorded in the dorsal raphe, respectively, of a 5-HTT +/+ (A), 5-HTT +/− (B), and 5-HTT −/− (C) mouse. The dots at the bottom of the traces represent interruptions of the physiograph. The time base applies to all traces. 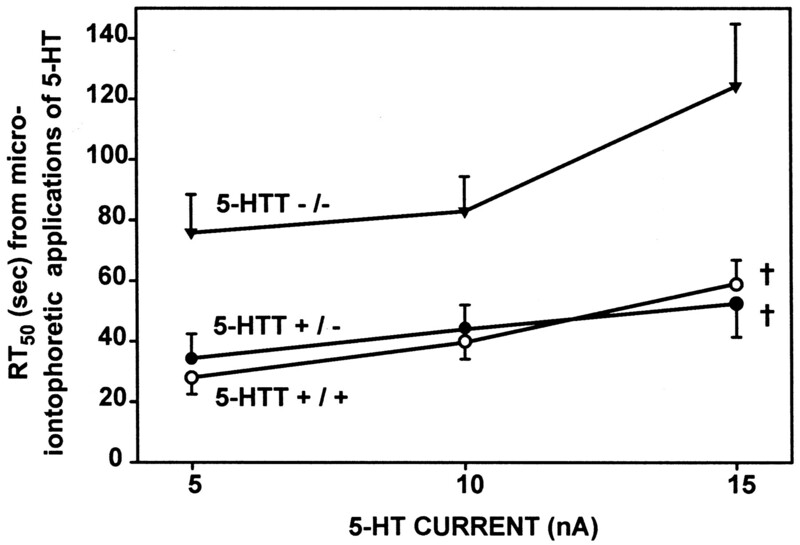 Mean frequency of firing of 5-HT cells in the dorsal raphe of 5-HTT +/+, 5-HTT +/−, and 5-HTT −/− mice. The number of recorded neurons and of mice used is indicated in the boxes at the bottom of each column. Data were analyzed using a one-way analysis of variance (p < 0.001); a multiple comparison showed statistically significant differences between 5-HTT +/+ versus 5-HTT +/−, and 5-HTT +/+ versus 5-HTT −/− mice (†P < 0.001 using one-way analysis of variance). Effect of Microiontophoretic Application of the 5-HT1AAgonist 8-OH-DPAT on the Firing Activity of Dorsal Raphe 5-HT Neurons. To determine the sensitivity of the 5-HT1A autoreceptors, two-barreled electrode descents were carried out through the DRN. Small ejection currents (+1 to +4 nA) of 8-OH-DPAT consistently produced a decrease of the firing activity of 5-HT neurons in the six 5-HTT +/+ mice tested. The 5-HTT −/− mice showed a marked attenuation of response to the ejection of the 8-OH-DPAT and the 5-HTT +/− group showed variable responses (n = 8 and 7, respectively). A two-way (genotype × current) ANOVA revealed a significant effect of genotype (F2,116 = 28.51, P < 0.001), but not significant effects of 8-OH-DPAT currents (F2,116 = 2.1, P = 0.08), and no significant interaction. Multiple comparison procedures showed a significant attenuation of the response to 8-OH-DPAT between the 5-HTT +/+ and both types of mutant mice as well as between the 5-HTT +/− and the 5-HTT −/− mice (Fig.3). A, sensitivity, measured in percentage of inhibition (mean ± S.E.M. ), of 5-HT neurons to microiontophoretic applications of 8-OH-DPAT (1, 2, and 4 nA). The number of neurons tested is given at the bottom of each column.†P < 0.001, using a two-way analysis of variance and a multiple comparison procedure showed significant differences between 5-HTT −/− mice versus 5-HTT +/+ mice, 5-HTT −/− mice versus 5-HTT +/− mice and 5-HTT +/− mice versus 5-HTT +/+ mice. B. Integrated firing rate histograms of three 5-HT neurons, showing their response to microiontophoretically applied 8-OH-DPAT in the 5-HTT +/+, +/−, and −/− mice. The bars above the traces indicate the duration of application for which the ejection currents are given in nanoamperes. Time base applies to all traces. Electrophysiological Assessment of 5-HT Transporter Function in the Hippocampus. For pyramidal neurons in the CA3 region, significantly less quisqualate was required to activate neurons in the 5-HTT −/− and 5-HTT +/− mice than in the 5-HTT +/+ mice (F2,74 = 15.78; P < 0.001) to achieve similar firing frequencies (Fig. 4). The duration of suppression following 5-HT applications was assessed in 5-HTT +/+ mice using increasing currents of 5-HT. The recovery time (RT50 value) in the 5-HTT +/+ group (n = 7) was proportional to the current used: 5 nA applications yielded an RT50 value of 28 ± 5 s, which increased by 39% at the current of 10 nA and by 110% at the current of 15 nA. In the 5-HTT −/− group (n = 7), the effect of microiontophoretically applied 5-HT was prolonged: the values for 5-, 10-, and 15-nA applications were increased by 270, 209, and 210%, respectively, compared with the values obtained in the 5-HTT +/+ mice. A two-way (genotype × current) ANOVA revealed a significant effect of genotype (F2,126= 24, P < 0.001), and a significant effect of 5-HT currents (F2,126 = 8.3,P < 0.001), and no significant interaction effect. Multiple comparison procedures revealed that the RT50 of 5-HTT −/− mice is longer than the RT50 of 5-HTT +/− and 5-HTT +/+ mice; no difference was found between the wild-type mice and the 5-HTT +/− group (n = 6; Figs. 5 and6). Ejection currents of quisqualate (mean ± S.E.M.) used to activate pyramidal neurons in the CA3hippocampus to achieve the basal firing frequency of 8 to 15 Hz in the 5-HTT +/+, +/−, and −/− mice. The number of neurons recorded is indicated in the boxes at the bottom of each column.†P < 0.001, using one-way analysis of variance; a multiple comparison procedure showed significant differences between 5-HTT −/− versus 5-HTT +/+ and 5-HTT +/− versus 5-HTT +/+ mice. Integrated firing rate histograms showing the response of a representative dorsal hippocampus CA3pyramidal neuron to increasing microiontophoretic currents of 5-HT and 8-OH-DPAT in a 5-HTT +/+ (A), a 5-HTT +/− (B), and a 5-HTT −/− (C) mouse. The rectangles above the traces indicate the time of microiontophoretic ejections with the ejection values in nanoamperes denoted above the rectangles. An ejection current of −10 nA of quisqualate was used to activate the neuron in the 5-HTT +/+ mouse, whereas a retaining current +3 nA of quisqualate was used to activate the neurons in both 5-HTT +/− and 5-HTT −/− mice. Recovery time, expressed as RT50 values (mean ± S.E.M. ), of dorsal hippocampus CA3 pyramidal neurons from microiontophoretically applied 5-HT in 5-HTT +/+, +/−, and −/− mice. The number of neurons recorded for each value ranges from 20 to 10. †P < 0.001, using two-way analysis of variance; a multiple comparison procedure showed a significant difference between 5-HTT −/− versus 5-HTT +/−, and 5-HTT −/− versus 5-HTT +/+ mice. A significant difference (P < 0.001) was also found between currents: 15 versus 5 nA and 15 versus 10 nA. Effects of Acute Intravenous Administration of Paroxetine on the Recovery Time from Microiontophoretic Applications of 5-HT. The selective 5-HT reuptake inhibitor paroxetine was tested in four 5-HTT +/+ and five 5-HTT +/− mice to examine possible alterations of the function of the 5-HTT in animals with a 5-HTT mutation. The results showed that paroxetine was able to significantly prolong the RT50 in both the 5-HTT +/+ group and 5-HTT +/− group (Fig. 7), and to the same duration as in the 5-HTT −/− mice (Fig. 6), thus constituting an internal standard for the absence of the 5-HTT. A two-way (genotype × current) ANOVA revealed a significant effect of genotype (F3,55 = 5.82, P = 0.002), but not significant effect of 5-HT currents (F3,55 = 2.3, P = 0.1), and no significant interaction effect. Multiple comparison procedures revealed that the paroxetine was able to prolong in a significant manner the RT50 values in 5-HTT +/+ and 5-HTT −/− compared with the respective pretreated groups. A, graphic showing the recovery times, expressed as RT50 values (mean ± S.E.M.) of dorsal hippocampus neurons from microiontophoretically applied 5-HT (5, 10, 15 nA) in 5-HTT +/+ mice prior and following paroxetine (10 mg/kg, i.p.) administration (black hatched columns). The number of neurons recorded is indicated in the boxes at the bottom of each column.†P = 0.002, using a two-way analysis of variance; a multiple comparison procedure showed a significant difference when the 5-HTT +/+ value following paroxetine was compared with the respective before paroxetine value (black columns). B, graphic showing the recovery times, expressed as RT50 values (mean ± S.E.M.) of dorsal hippocampus neurons from microiontophoretically applied 5-HT (5, 10, 15 nA) in 5-HTT +/− mice prior and following paroxetine (10 mg/kg i.p.) administration (gray hatched columns). The number of neurons recorded is indicated in the boxes at the bottom of each column. †P= 0.002, using a two-way analysis of variance; a multiple comparison procedure showed a significant difference when the 5-HTT +/− value following paroxetine was compared with the respective before paroxetine value (gray columns). The maximal inhibitory action of 5-HT was not changed after the administration of paroxetine in both groups, thereby demonstrating that reuptake inhibition prolongs the duration but not the intensity of the response to 5-HT in the synaptic cleft. Responsiveness of CA3 Dorsal Hippocampus Pyramidal Neurons to Microiontophoretic Applications of 5-HT and 8-OH-DPAT. Microiontophoretically applied 5-HT induced a current-dependent inhibition of CA3 pyramidal firing activity in the three groups of animals (Fig. 5). The two-way ANOVA followed by a multiple comparison procedures, revealed a significant difference between the 5- and 15-nA currents in all groups (F2,156 = 4.41; P = 0.014, Fig. 8A). Among the three different genotypes of mice, there was no statistically significant difference (F2,156 = 1.84;P = 0.15) in the response to 5-HT, although there was a tendency for an attenuation in both 5-HTT +/− (n = 5) and 5-HTT −/− mice (n = 4) compared with the three 5-HTT +/+ mice. A, responsiveness of hippocampus CA3pyramidal neurons to increasing currents of 5-HT in 5-HTT +/+, 5-HTT +/−, and 5-HTT −/− mice, expressed as percentage of firing inhibition compared with the previous 50 s of baseline firing. The number of neurons recorded for each value varied from 28 to 12. A two-way analysis of variance, multiple comparison procedure showed a significant difference between 15- versus 5-nA currents. B, responsiveness of hippocampus CA3 pyramidal neurons to increased doses of 8-OH-DPAT in 5-HTT +/+, +/−, and −/− mice, expressed as percentage of firing inhibition comparing to the previous 50 s of baseline firing. The number of neurons recorded for each value was from 25 to 9. †P = 0.002, using a two-way analysis of variance; a multiple comparison procedure showed a significant difference between 5-HTT −/− versus 5-HTT +/+. A two-way analysis of variance showed a significant difference (P < 0.014) between 15- versus 5-nA currents. Excitatory responses to microiontophoretically applied 5-HT were rarely observed: one neuron in a 5-HTT +/+, three in 5-HTT +/−, and three in 5-HTT −/− mice, respectively. These cells were no different in term of localization and depth. Microiontophoretic application of the 5-HT1Aagonist 8-OH-DPAT current-dependently inhibited firing activity in the three groups. A two-way (genotype × current) ANOVA followed by multiple comparison procedures revealed a significant inhibition at the current of 5 and 15 nA (F2,113 = 6.20;P < 0.05) and showed that the 5-HTT +/+ group differed from 5-HTT −/− group (F2,113 = 6.43,P = 0.002), but not from the 5-HTT +/− group. 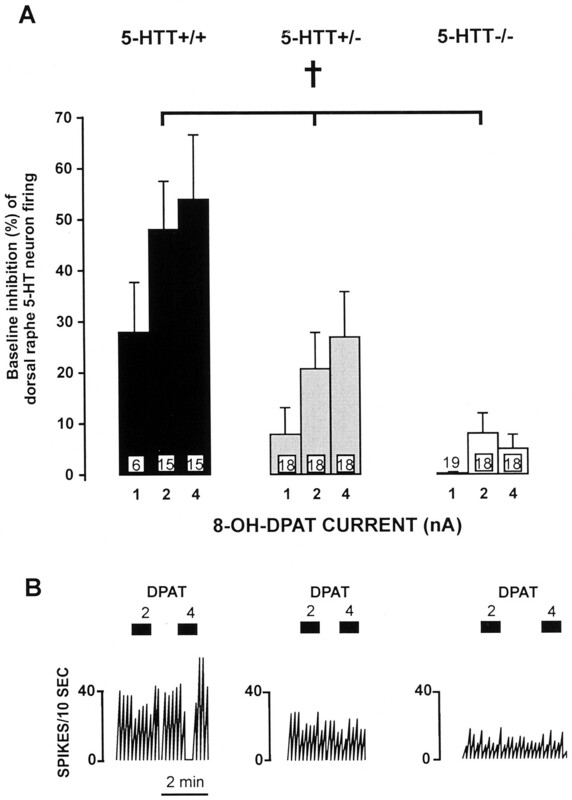 In other words, the 5-HTT −/− mice showed an attenuated response to 8-OH-DPAT, whereas the 5-HTT +/− mice showed an intermediate response to 8-OH-DPAT (Figs. 5 and 8B). Interestingly, in two 5-HTT +/− animals, the 8-OH-DPAT responses were tested both in the raphe and in the hippocampus and an attenuated response was observed in the raphe but not in the hippocampus. Effects of the 5-HT Antagonists WAY 100635 on the Responsiveness of CA3 Dorsal Hippocampus Pyramidal Neurons to 5-HT and 8-OH-DPAT. Further experiments were carried out to study the effect of the selective 5-HT1A antagonist WAY 100635 on its ability to block the inhibitory response of 5-HT and 8-OH-DPAT because of the desensitization of pyramidal neurons to the latter but not the former agent. WAY 100635 (0.3 mg/kg i.p.) did not significantly modify firing rates per se under the present conditions but it blocked the response to 8-OH-DPAT in the 5-HTT +/+ (n = 5), +/− (n = 4), and −/− (n = 3) mice (Fig. 9A). WAY 100635 also attenuated the inhibitory response to 5-HT in 5-HTT +/+, +/−, and −/− mice but to different extents: consistently so in the 5-HTT −/− (F1,6 = 36.28;P < 0.001) and the 5-HTT +/− (F1,8 = 11.43; P = 0.01) mice, but not in the 5-HTT +/+ group (F1,12 = 2.4, P = 0.14, Fig. 9B). A, graphic showing the mean (±S.E.M.) percentage of baseline inhibition induced by microiontophoretically applied 8-OH-DPAT (10 nA) on hippocampus pyramidal neurons of 5-HTT +/+ and 5-HTT +/− mice before (▪) and following WAY 100635 (0.3 mg/kg i.p.) administration (▧). The number of neurons recorded is indicated in the boxes at the bottom of each column. *P < 0.05, **P < 0.005 compared with the respective basal value, using two-way analysis of variance and a multiple comparison procedure. B, graphic showing the mean (±S.E.M.) percentage of baseline inhibition induced by microiontophoretically applied 5-HT (10 nA) on hippocampus CA3 pyramidal neurons of 5-HTT +/+ and 5-HTT +/− mice before (▪) and following WAY 100635 (0.3 mg/kg i.p.) administration (▧). The number of neurons recorded is indicated in the boxes at the bottom of each column. *P < 0.05, **P < 0.005 compared with respective predrug value using one-way analysis of variance and a multiple comparison procedure. The present experiments, with respect to a multitude of previous pharmacological studies, establish that the 5-HTT plays an important role in controlling the duration of the synaptic action of 5-HT in the central nervous system, and that it also plays a critical role in regulating presynaptic 5-HT homeostasis. A clear indication of the former assertion is the identical recovery times of pyramidal neurons following microiontophoretic applications of 5-HT in the 5-HTT −/− mice compared with the 5-HTT +/+ animals given an optimal dose of the SSRI paroxetine (i.e., ∼120 s, Figs. 6 and 7). With respect to the second statement, it can be emphasized that the neuronal firing activity of DRN 5-HT neurons was reduced in the 5-HTT −/− and 5-HTT +/− groups (Figs. 1 and 2), despite a desensitization of the somatodendritic 5-HT1A receptors in both groups (Fig. 3). The latter data are consistent with the results of radioligand binding and immunochemistry studies: the specific labeling of 5-HT1A receptor sites by the selective antagonist [3H]WAY 100635, or by specific antibodies showed approximately a 40% decrease in the DRN of brain preparations of 5-HTT −/− versus 5-HTT +/+ mice (Rioux et al., 1998;Li et al., 1999). The decrease in DRN 5-HT neuronal firing activity was similar to that reported for several 5-HT1Areceptors agonists and SSRI upon treatment initiation: gepirone, tandospirone, ipsapirone, BAY x 3702, flesinoxan (Haddjeri et al., 1999), and several SSRI, such as citalopram (Chaput et al., 1986) and paroxetine (Le Poul et al., 1995). This is generally followed by a partial recovery of the firing rate after 1 week of treatment and a complete recovery after 2 weeks. This progressive recovery has been attributed to the desensitization of the somatodendritic 5-HT1A autoreceptors, which normally modulate the firing activity of 5-HT neurons in a negative feedback inhibitory manner. In contrast, however, a decreased firing rate was observed in both 5-HTT +/− and −/− mice despite a desensitization of somatodendritic 5-HT1A receptors (Figs. 2 and 3). These data imply that differential adaptive mechanisms at the DRN level were operative in 5-HTT mutant mice to counteract the robust increase of extracellular 5-HT levels. This was demonstrated in microdialysis studies (Fedele and Andrews, 1999) and by the present results showing a 127% increase in the mean firing rate of 5-HT neurons following the injection of WAY 100635 in 5-HTT −/− mice. It is nevertheless surprising that despite an approximately 50% reduction of the sensitivity of 5-HT1A autoreceptors in the 5-HTT +/− mice, the mean firing rates of 5-HT neurons was still attenuated by almost 30% (Figs. 2 and 3). In the above-cited pharmacological studies, such a degree of desensitization allows a full recovery of firing activity of 5-HT neurons. Moreover in 5-HTT −/− mice, in which it may be assumed that extracellular 5-HT levels in the raphe are markedly augmented, the mean firing rate of 5-HT neurons was decreased by more than 60% in the presence of desensitized 5-HT1A autoreceptors. Clearly, the relationship between autoreceptor sensitivity, firing rate, extracellular 5-HT levels and 5-HT synthesis need to be further investigated. In analogy, in dopamine transporter −/− mice, dopamine extracellular levels were 5 times greater than control animals and were associated with a 95% decrease in dopamine content, a 75% reduction in release, but a 100% enhancement of dopamine synthesis (Jones et al., 1998). A further adaptation phenomenon in the hippocampus was observed: the small albeit significant desensitization of postsynaptic receptors in the 5-HTT −/− group, but not in the 5-HTT +/− and +/+ groups. This is not a first, however, for this population of postsynaptic receptors. Indeed, following a 21-day treatment with clorgyline, a selective monoamine oxidase inhibitor-A antidepressant drug, a desensitization of postsynaptic hippocampus 5-HT1A receptors was previously observed (Blier et al., 1986). Nevertheless, an enhancement of the effectiveness of 5-HT pathway electrical stimulation on the firing of these pyramidal neurons was still obtained, thus indicating that overall neurotransmission was nevertheless increased. Therefore, it may be stated that optimal monoamine oxidase inhibition or a genetic deletion of the 5-HT transporter may both cause an attenuated 5-HT1A receptor sensitivity at the hippocampal level, but an augmentation of net 5-HT neurotransmission. The present results show that 5-HT1A receptors are desensitized at the presynaptic and postsynaptic level in the 5-HTT −/− mice (Figs. 3 and 8). Mannoury-La Cour et al. (1998), using an in vitro electrophysiological approach whereby 5-HT neurons are driven artificially using phenylephrine, showed that the 5-HT1A agonist ipsapirone was markedly less potent in inhibiting DRN cell firing in mutants since its EC50 was about 500- and 40-fold higher in 5-HTT −/− and +/− mice, respectively, than in 5-HTT +/+ mice. In contrast to the present findings, they observed that the hyperpolarization in response to 5-HT1A receptor stimulation of CA1 neurons was not significantly different in the three groups of mice. Although the properties of 5-HT1A receptors are somewhat different in CA1 and CA3 subfields of the hippocampus (Beck et al., 1992), no significant differences were evident using the present in vivo electrophysiological approach (Blier et al., 1993). The discrepancy between the present results, obtained in vivo, versus the previous data generated in vitro most likely stems from the latter method being less sensitive to detect moderate-to-small, but still significant, alterations in receptor responsiveness. Indeed, membrane hyperpolarization by several millivolts usually requires superfusion of micromolar concentrations of 5-HT agonists (Andrade and Nicoll, 1987), in contrast to a few nanoamperes applied to a millimolar solution to eject agonists using the in vivo microiontophoretic approach. Another indication of the fact that different neuronal mechanisms are solicited when using such in vitro and in vivo approaches in the raphe and the hippocampus is as follows. Nanomolar and micromolar concentrations of 5-HT1A agonists are necessary, respectively, when examining firing rate changes in the raphe and membrane hyperpolarization in the hippocampus, whereas identical solutions and ejection currents can be used in vivo when examining firing rate alterations (Sprouse and Aghajanian, 1987, 1988; Blier et al., 1993). These methodological considerations are all the more important given the degree of sensitivity changes observed in the raphe and the hippocampus in the present experiments: a near abolition of the response in the 5-HT neurons and only a small but consistent 20% difference for the three ejection currents of 8-OH-DPAT in the hippocampus (Figs. 3 and 8). The electrophysiological data are consistent with the more pronounced reduction in 5-HT1A binding sites and function found in the DRN than in the hippocampus (Li et al., 1999, 2000). The 5-HT1A antagonist WAY 100635 was not able to block in a significant manner the inhibitory response of 5-HT in 5-HTT +/+ mice, but it was effective in 5-HTT −/− and +/− mice. In contrast, the inhibitory action of the 5-HT1Aagonist 8-OH-DPAT was significantly attenuated in the three groups of mice (Fig. 9A). This lack of effect of WAY 100635 in the hippocampus of 5-HTT +/+ animals might be explained by the possibility that 5-HT acts in part in these mice via other 5-HT receptor subtype(s). In contrast, in 5-HTT +/− and 5-HTT −/− mice such receptors would be desensitized, thus leaving predominantly but not exclusively, 5-HT1A receptors responsive to 5-HT. For instance, Rioux et al. (1999) demonstrated that the specific labeling of 5-HT2A receptors by [3H]MDL 100907 was significantly decreased (30–40%) in the substantia nigra and cerebral cortex of the 5-HTT −/− mice. 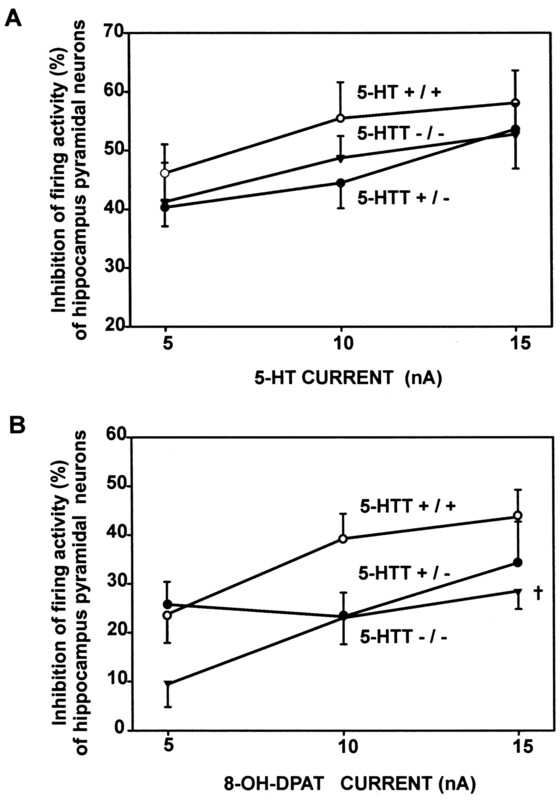 Given that 5-HT2 agonists produce a suppressant effect on the firing activity of forebrain neurons under the present experimental conditions (Ashby et al., 1989; Bergqvist et al., 1999), the present results therefore suggest that the response to 5-HT in 5-HTT +/+ mice may be mediated by several 5-HT receptor subtypes on such pyramidal neurons. This could explain why in the 5-HTT +/− and −/− mice, where a likely decrease of the sensitivity of these postsynaptic receptors occurred, the inhibitory effect of WAY 100635 in blocking the 5-HT inhibition was more evident (Fig. 9B). This study allowed a further understanding the role of 5-HT reuptake carrier in the synaptic mechanisms. Although the 5-HT uptake carrier is not a 5-HT receptor per se, it presents several characteristics of 5-HT receptors. In the present study, it was established that the 5-HT reuptake carrier plays a key role in the regulation of 5-HT neurotransmission: it regulates directly the duration of the action of 5-HT in the synapse but it did not appear to control the maximal intensity of the 5-HT response. This was suggested by the lack of effect of paroxetine on the latter parameter in 5-HTT +/− and +/+ mice and, more importantly, the unaltered degree of suppression of firing during the microiontophoretic application of 5-HT. 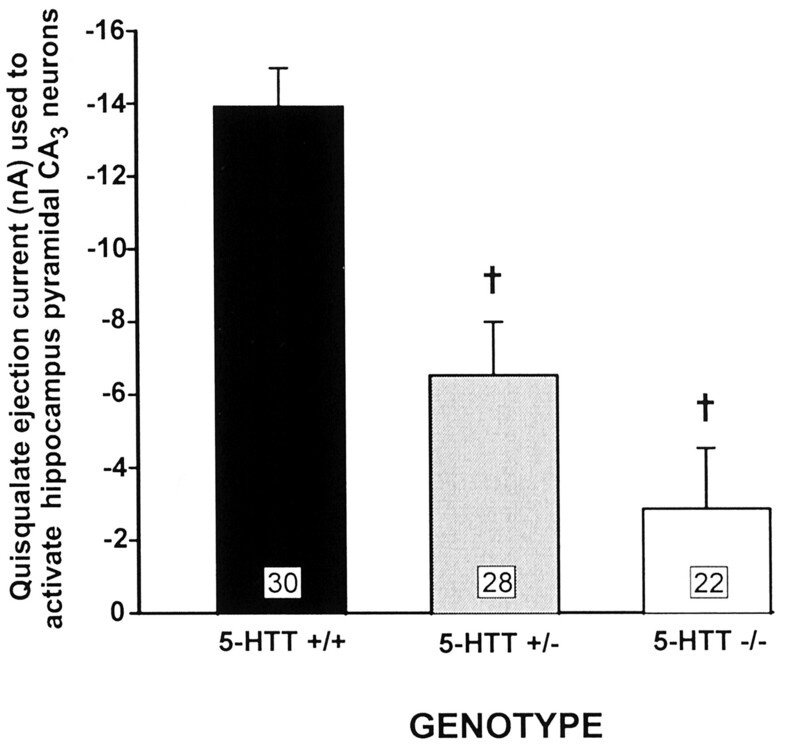 Moreover, the lack of 5-HTT is able to induce a desensitization of both at the presynaptic and postsynaptic 5-HT1A levels (Li et al., 1999) and the presence of 50% of the 5-HTT in the +/− animals was able to preserve a normal reuptake function in the hippocampus (Fig. 6). Such results obtained in vivo are fully consistent with data generated in vitro using [3H]5-HT uptake measurements in cerebral cortex synaptosomes (Bengel et al. 1998). However, in the brainstem [3H]5-HT uptake was normal in 5-HTT +/− mice in the latter study, whereas, in the raphe area, 5-HT neuronal firing rates were attenuated, despite a decreased function of the somatodendritic 5-HT1A autoreceptors (Figs. 2and 3). This discrepancy may arise from the fact that the synaptosomes were prepared from the entire brainstem but that the recordings were obtained specifically from the dorsal raphe nucleus. Another interesting finding was the differential effects of quisqualate in the hippocampus among the three different groups. 5-HTT +/− and −/− mice needed a smaller dose of quisqualate to activate their CA3 pyramidal neurons (Fig. 4). Rueter et al. (2000) have found similar results in 5-HT2Creceptor mutant mice. Previous studies have reported that 5-HT2C receptor mutant mice are more susceptible to spontaneous and pharmacologically induced seizures (Tecott et al., 1995). Taken together, these results indicate that 5-HT receptors indeed may play a tonic inhibitory role in membrane excitability. 5-HTT +/− mice, in which only one of the two 5-HTT alleles has been deleted, show neurochemical changes that partially resemble those observed in humans and nonhuman primates carrying low activity alleles of the 5-HTT gene-linked polymorphic region, which may increase the risk of developing depressive illness attributable to an excess of 5-HT (Lesch, 1998). The 5-HTT +/− could therefore provide a more adequate model to reassess classical treatments for this disorder (Mössner and Lesch, 1998) and further studies are needed to clarify the complexity of adaptive mechanisms observed in this population. Another important challenge will also be to unravel the simplistic comprehension of the mechanism of SSRI: the prolongation of the presence of 5-HT in the synaptic cleft is only the first step that enables modification of the sensitivity of 5-HT receptors leading to alteration in other systems, which would account for the maintenance of the antidepressant response after the drug is discontinued. Send reprint requests to: Pierre Blier, M.D., Ph.D., Department of Psychiatry, University of Florida Brain Institute, P.O. Box 100256, Gainesville, FL 32610. This study was supported in part by a Medical Research Council of Canada (MRC) Grant no. 11014 and Scientist Award to P.B. ; G.G. is a Ph.D. fellow from the Department of Neuroscience, “B. Brodie”, University of Cagliari (Italy), and a recipient of Royal Victoria Hospital, Wyeth Ayerst Canada, and MRC fellowships. K.-P.L. is supported by the Hermann and Lilly Schilling Foundation. The present work was presented at the 29th Annual meeting of the Society for Neuroscience in Miami, FL, October 1999 and at the 38th Annual meeting of the American College of Neuropsychopharmacology (ACNP) in Acapulco, Mexico, December 1999. (1987) Novel anxiolytics discriminate between postsynaptic serotonin receptors mediating different physiological responses on single neurons of the rat hippocampus. Naunyn-Schmiedeberg's Arch Pharmacol 336:5–10. (1989) Effects of (+/−)-DOI on medial prefrontal cortical cells: A microiontophoretic study. Brain Res 498:393–396. (1992) Comparison of 5-hydroxytryptamine1A-mediated hyperpolarization in CA1 and CA3 hippocampal pyramidal cells. J Pharmacol Exp Ther 263:350–359. (1998) Altered brain serotonin (5-HT) homeostasis and locomotor insensitivity to MDMA (“ectasy”) in 5-HT transporter-deficient mice. Mol Pharmacol 53:649–655. (1998) Blunted 5-HTlA-receptor agonist-induced corticotropin and cortisol responses after long-term ipsapirone and fluoxetine administration to healthy subjects. Clin Pharmacol Ther 63:428–436. (1999) Effect of atypical antipsychotic drugs on 5-HT2 receptors in the rat orbito-frontal cortex: An in vivo electrophysiological study. Psychopharmacology 143:89–96. (1986) Modification of serotonergic and noradrenergic neurotransmissions by repeated administration of monoamine oxidase inhibitors: Electrophysiological studies in the rat central nervous system. J Pharmacol Exp Ther 237:987–994. (1997) Early onset of therapeutic action in depression and greater efficacy of antidepressant treatments: Are they related? Int Clin Psychopharmacol 12 (Suppl 3) S21–S28. (1998) Possible serotoninergic mechanism underlying the antidepressant and anti-obsessive-compulsive disorder responses. Biol Psychiatry 44:313–323. (1993) Differential properties of pre- and postsynaptic 5-hydroxytryptamine1A receptors in the dorsal raphe and hippocampus: I. Effect of spiperone. J Pharmacol Exp Ther 265:7–15. (1987) Diurnal rhythms in the responsiveness of hippocampal pyramidal neurons to serotonin, norepinephrine, gamma-aminobutyric acid and acetylcholine. Brain Res Bull 18:205–212. (1986) Effects of a selective 5-HT reuptake blocker, citalopram, on the sensitivity of 5-HT autoreceptors: Electrophysiological studies in the rat brain. Naunyn-Schmiedeberg's Arch Pharmacol 333:342–348. (1999) A microdialysis study of the effects of genetic inactivation of the serotonin transporter gene on baseline and K+-stimulated serotonin concentrations in mouse striatum. in Monitoring Molecules in Neuroscience, 8th International Conference in in Vivo Methods, eds Rollema E, Abercrombie E, Sulzer D, Zackheim J (The State University of New York, Stony Brook), pp 193–194. (1996) Electrophysiological, biochemical, neurohormonal, and behavioral studies with WAY 100,635, a potent, selective, and silent 5-HT1A receptor antagonist. Behav Brain Res 73:337–353. (1997) The Mouse Brain in Stereotaxis Coordinates. (Academic Press, San Diego). (1987) Noradrenergic denervation prevents sensitization of rat forebrain neurons to tricyclic antidepressant treatment. Synapse 1:133–139. (1999) Genetic variation in the serotonin transporter promoter region affects serotonin uptake in human platelets. Am J Med Genet 88:83–87. (2000) Association between the serotonin transporter promoter polymorphism and personality traits in a primarily female population sample. Am J Med Genet 96:202–216. (1999) Effect of sustained administration of the 5-HT1A receptor agonist flesinoxan on rat 5-HT neurotransmission. Eur Neuropsychopharmacol 9:427–440. (1996) A 5-hydroxytryptamine lesion markedly reduces the incidence of burst-firing dorsal raphe neurons in the rat. Neurosci Lett 204:161–164. (1998) Reduced central serotonin transporter in alcoholism. Am J Psychiatry 155:1544–1549. (1961) Electrophysiology of hippocampal neurons. II. After-potentials and repetitive firing. J Neurophysiol 24:243–259. (1995) Early desensitization of somato-dendritic 5-HT1A autoreceptors in rats treated with fluoxetine or paroxetine. Naunyn-Schmiedeberg's Arch Pharmacol 352:141–148. (1991) 5-HT1A receptor responsivity in anxiety disorders and depression. Prog Neuropsychopharmacol Biol Psychiatry 15:723–733. (1996) Association of anxiety-related traits with a polymorphism in the serotonin transporter gene regulatory region. Science (Wash DC) 274:1527–1531. (1998) Serotonin transporter and psychiatric disorders: Listening to the gene. Neuroscientist 4:25–34. (1997) A desensitization of hypothalamic 5-HT1A receptors by repeated injections of paroxetine: Reduction in the levels of G(i) and G(o) proteins and neuroendocrine responses, but not in the density of 5-HT1A receptors. J Pharmacol Exp Ther 282:1581–1590. (2000) Reduction in the density and expression, but not G-protein coupling, of serotonin receptors (5-HT1A) in 5-HT transporter knock-out mice: Gender and brain region differences. J Pharmacol Exp Ther 20:7888–7895. (1999) Reduction of 5-HT1A-mediated temperature and neuroendocrine responses and 5-HT1A binding sites in 5-HT transporter knock-out mice. J Pharmacol Exp Ther 291:999–1007. (1999) Pindolol and mianserin augment the antidepressant activity of fluoxetine in hospitalized major depressed patients, including those with treatment resistance. J Clin Psychopharmacol 19:177–182. 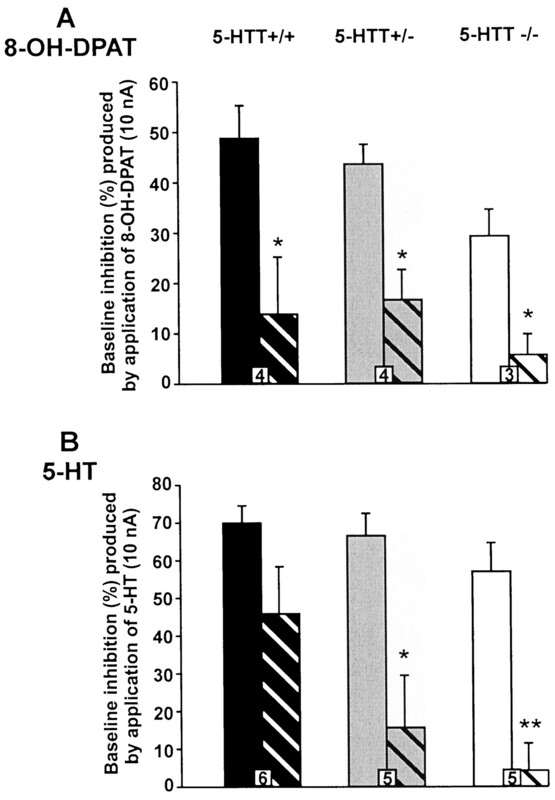 (1998) Functional adaptation of 5-HT1A receptors in mice lacking the 5-HT transporter (Abstract). Society for Neuroscience, 28th annual meeting, Los Angeles, CA, November 7–12, 440.5. (1998) Knockout mice in neuropsychopharmacology: Present and future. Int J Neuropsychopharmacol 1:87–92. (1999) Molecular manipulations as tools for enhancing our understanding of 5-HT neurotransmission. Trends Pharmacol Sci 20:246–252. (1994) Desensitization of the neuronal 5-HT carrier following its long-term blockade. J Neurosci 14:3036–3047. (1998) Adaptive changes in central 5-HT receptors in knock-out mice lacking the 5-HT transporter (Abstract). Society for Neuroscience, 28th annual meeting, Los Angeles, CA, November 7–12, 440.4. 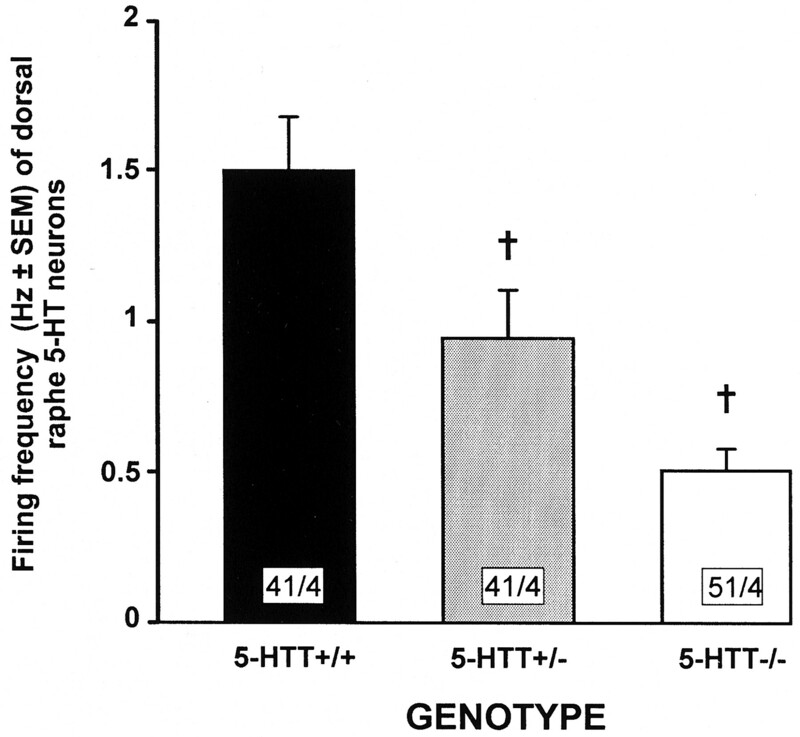 (1999) Adaptive changes of serotonin 5-HT2A receptors in mice lacking the serotonin transporter. Neurosci Lett 262:113–116. 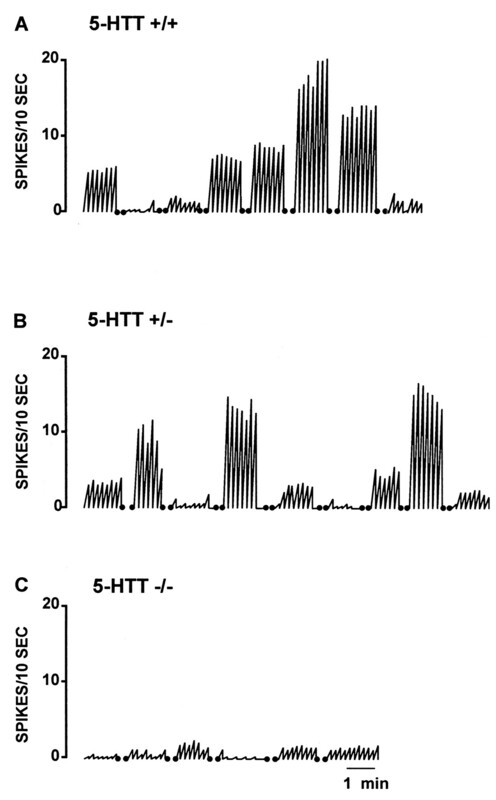 (2000) In vivo electrophysiological examination of 5-HT2 responses in 5-HT2C receptor mutant mice. Naunyn-Schmiedeberg's Arch Pharmacol 361:484–491. (1997) Effect of paroxetine and nefazodone on 5-HT1A receptor sensitivity. Psychopharmacology 132:296–302. 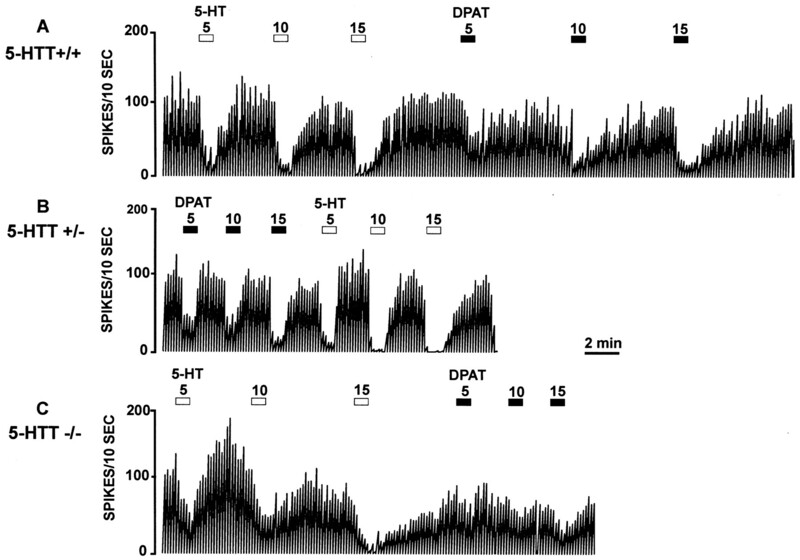 (1987) Electrophysiological responses of serotoninergic dorsal raphe neurons to 5-HT1A and 5-HT1B agonists. Synapse 1:3–9. (1988) Responses of hippocampal pyramidal cells to putative serotonin 5-HT1A and 5-HT1B agonists: A comparative study with dorsal raphe neurons. Neuropharmacology 27:707–715. (1995) Eating disorder and epilepsy in mice lacking 5-HT2C serotonin receptors. Nature (Lond) 374:542–546. (1998) Faster onset of fluvoxamine in combination with pindolol in the treatment of delusional depression: A controlled study. J Clin Psychopharmacol 18:441–446.